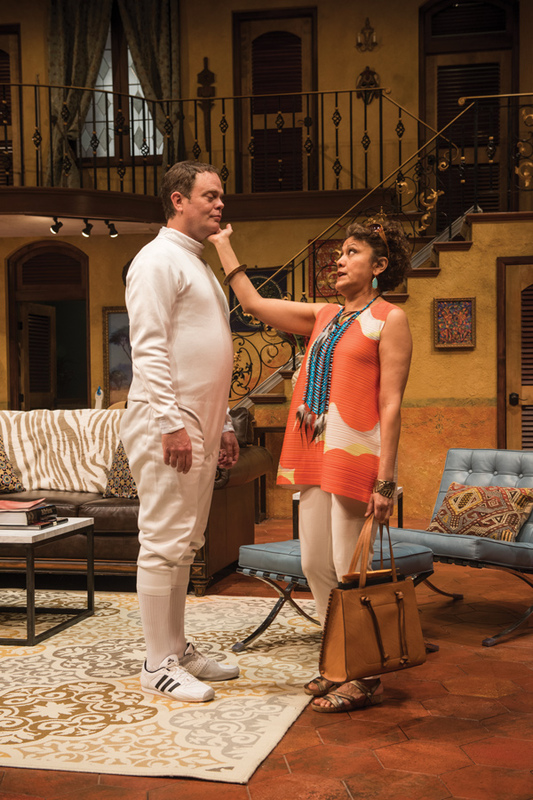 Communication lecturer Sandra Marquez (right) performs alongside actor Rainn Wilson in Steppenwolf Theatre’s “The Doppelgänger.” The show runs from April 5 to May 27. Communication Prof. Todd Rosenthal had to consider some unusual factors when putting together the set of “The Doppelgänger” — for example, he had to make sure he could wash fake blood stains out of the furniture after every run of the show. The production, which runs from April 5 to May 27, showcases one of more than 20 production sets Rosenthal has designed for Steppenwolf Theatre Company — located in Chicago — and also features Communication lecturer Sandra Marquez as an ensemble member. Together, the two faculty members help bring Steppenwolf Theatre Company’s critique of African imperialism to life. When Wilson’s character falls ill with an important summit on the horizon, his feisty maid convinces the businessman’s American doppelgänger to attend the summit and intervene in the name of workers’ rights. As the set designer of the production, Rosenthal was faced with other challenges beyond searching for washable furniture. He said the most unique element of the set design was the ground plan, as he had to incorporate doors for the 12 rooms of the French colonial mansion. The doors are a key feature of the design because the set is “a vessel that accommodates for the business of the show,” he said. Playwright Matthew-Lee Erlbach said the conception of the play stemmed from his interest in resource politics and economic justice. He said the story is not just about Africa or the imperialism of the past, but also modern labor rights movements. The innovation of human civilization, he said, is still being built on the backs of struggling workers and slave labor. Erlbach said the main character, the maid, tries to save and protect her community of miners and expose the consequences of the copper mines to the imperialist businessmen, who are hyperbolized as versions of mosquitoes — after draining the people of their lives, they leave behind disease and devastation. This characterization points to the world’s failure of achieving collective progress for the common good, he said. “As a species, how can we have a computer in our pocket and travel the oceans of space and still be massacring each other for resources?” Erlbach said. Marquez said Erlbach thinks on several layers at once, delivering commentary on corporate conglomerates and international politics while packaging it into a humorous tale. She said the play should “give the audience pause,” allowing them to contrast the comfort of many American lives to the challenges of the less fortunate.